One of my earliest lessons about hiking in Washington State was: get used to cloudy, wet weather. Waiting for warm, sunny days means not getting out much. 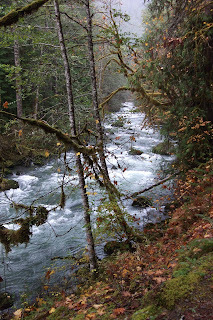 That lesson was foremost in my mind on Saturday as a friend and I hiked the Duckabush River trail in the Olympic National Forest. Morning weather in Olympia was foggy with a slight mist in the air and stayed the same with some heavier mist and drizzle in places was we headed north on Highway 101 along Hood Canal. Turning off the highway at the river, we saw a mantle of low clouds hovering over the peaks and ridges. Today would be a day to embrace the foggy, wet weather. The trail starts at a parking area off Forest Road 2510. We followed good trail up a slight incline and entered the Brothers Wilderness. The trail climbs over Little Hump. 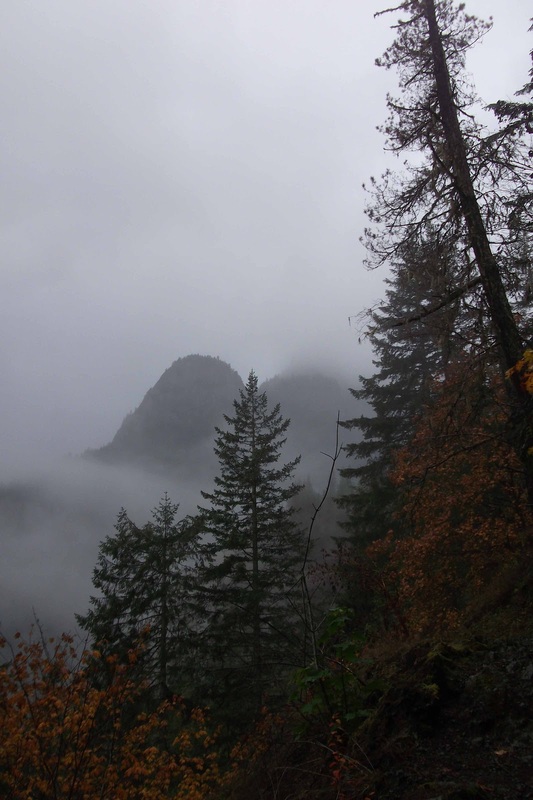 The climb is neither steep nor long but I quickly warmed up enough to dispense with my rain jacket. There was a fine mist in the air but nothing that required the jacket. After cresting Little Hump we could hear the Duckabush River, so far unseen on this route, crashing below. A series of short switchbacks brought us to river, swollen with water, its roar filling the valley. 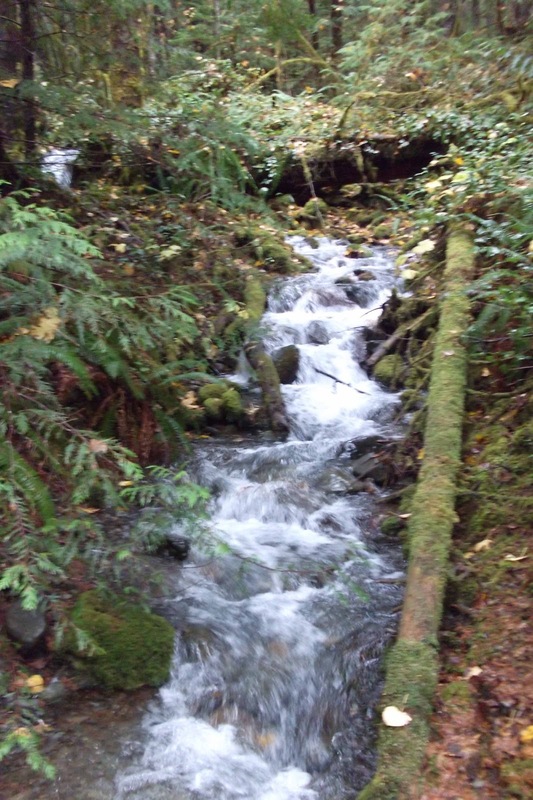 Water is everywhere--side streams flowing to the Duckabush, rivulets coursing down the trail to the nearest water bar, dripping from trees, droplets on leaves. Today is very wet but it's not rain-wet, a distinction I've come to understand and appreciate in Washington. Following the river for a short distance the trail is level, easy walking through a misty and moss covered forest. We spotted a steel rail, a leftover from the logging railroad that once plied this area. Then comes the climb up Big Hump, long series of switchbacks that lead to two open overlooks offering grand views of St. Peters Dome to the south and the Cascade Mountains to the east. That's what the trail guide says. We could see the Dome off and one in between the clouds. I'm sure the Cascades were also in the east but we did not see them. What we could see--the intimate embrace of earth and sky--was as much view as I needed. Much of this climb passes through the blackened remains left by a 2011 Ten Mile (I think) wildfire. Lots of charred wood, some still standing, even more fallen and shattered. In the mist, the burned forest seems ghostly and abandoned until I look beyond the destruction to see new growth. Mother Earth is regenerating herself, continuing the long cycle of renewal that stretches back to the dawn of time. All of which feeds my soul. That's why I am here on this foggy, wet day. I can think of no better place to be. 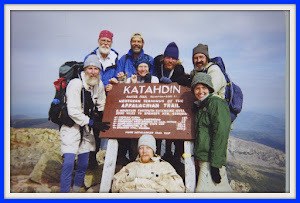 We climbed a bit farther until the trail crested Big Hump and began to descend. We did not. We turned around. Our slow climb up the switchbacks was a much faster descent. We made good time getting down and crossing the flat stretch along the river. The short climb up Little Hump was tiring, a reminder of the cumulative effect of the day's effort. But at this point I was on autopilot. I wasn't going to reach the car unless I walked so I walked and reached the car at the trailhead. Within the hour we were at the Tides Inn restaurant in Hoodsport watching rain pour outside while we ate hot food inside. Perfect timing. The hike is another in my "let's see how well I can hike with arthritis" assessment. Total distance was about eight miles with about 1700 feet of elevation gain. I carried maybe 20 pounds of gear so I could gauge how it felt carrying a load. I had no trouble walking or keeping a decent pace, although I was always conscious of my hip. Scrambling around deadfalls was awkward in a few places and I had to choose my steps carefully on wet descents and crossing streams. Eighteen hours later, I am stiff and both hips are a bit sore, the arthritic one a bit more so but not especially painful. A wet, cloudy day. The Olympic Mountains. All that I could ask for. I think I'm a Washingtonian now.